The third-round leader/co-leader has gone on to win the Masters Tournament 44 (out of 81) times, most recently Sergio Garcia (2017), Jordan Spieth (2015), Bubba Watson (2014) and Angel Cabrera (2009). So far this season on the PGA TOUR, 10 of 21 54-hole leaders have been able to convert for the win. Ian Poulter most recently achieved the feat at the Houston Open last week. 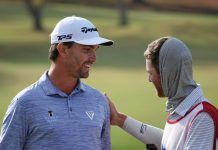 Dating to 1991, with the exception of Zach Johnson (T4) in 2007, Bubba Watson (T3) in 2012, Adam Scott (3rd) in 2013 and Danny Willett (T5) in 2016, the Masters champion has been ranked no lower than T2 following 54 holes. The only Masters champion who was not inside the top 10 on the leaderboard after 54 holes was Art Wall Jr. in 1959 (T13). The eventual Masters champion has come out of the final Sunday pairing 22 out of the last 27 years, with Zach Johnson (2007), Charl Schwartzel (2011), Bubba Watson (2012), Adam Scott (2013) and Danny Willett (2016) the exceptions. The largest 54-hole lead at the Masters is nine strokes (Tiger Woods/1997/won). The distinction for having the largest 54-hole lead that didn’t result in victory belongs to Greg Norman, who held a six-stroke lead after the third round in 1996, only to finish second. Former Augusta State University golfer Patrick Reed leads the Masters by three strokes over Northern Ireland’s Rory McIlroy after rounds of 69-66-67. Reed, a five-time PGA TOUR winner and U.S. Ryder Cup team standout, made eagles on both second-nine par-5s and has now played the par-5 holes 13-under for the week. This marks the sixth time Reed has held the 54-hole lead/co-lead on the PGA TOUR. He’s gone on to win three of five previous times. It’s the first time Reed has held the 54-hole lead in a major championship. Should Reed go on to win Sunday, he would claim his sixth PGA TOUR title, and first major championship, in his 166th TOUR start at age 27 years, 8 months, 3 days. Reed’s 14-under 202 is two shy of the 54-hole record of 200 (-16) set by Jordan Spieth in 2015. While the tournament record is 18-under 270 (shared by Tiger Woods/1997 and Jordan Spieth/2015), the most under-par any player has reached during the tournament is 19-under. Spieth reached 19-under at the 15th hole during the final round of 2015. Before Friday’s 66 and Saturday’s 67, Reed’s opening-round 3-under 69 marked his lowest round at Augusta National Golf Club. In four previous appearances at the Masters, Reed’s best score was 2-under 70 (twice, R1 and R4 in 2015). A T22 finish for Reed in 2015 is his best showing in four Masters starts (MC/2017, T49/2016, T22/2015, MC/2014). Reed has played every major championship (17) since the 2014 Masters. His lone top-10 finish is T2 at the 2017 PGA Championship. Reed comes to the Masters with three consecutive top-10 results on the PGA TOUR this season – T2/Valspar Championship, T7/Arnold Palmer Invitational, T9/WGC-Dell Technologies Match Play. Reed defeated Rory McIlroy 1-up in an epic singles match at the 2016 Ryder Cup. In Sunday’s final round, Reed will be paired with Rory McIlroy for the fifth time in a stroke play round on the PGA TOUR. Reed has bettered McIlroy once in the four previous rounds where they have been paired together. Reed is the only player in the field with three rounds in the 60s. Since the Masters began in 1934, not a single player has shot four rounds in the 60s during a Masters Tournament. Reed hit 14 of 18 greens in regulation, 11 of 14 fairways, and needed 28 putts in the third round. Rory McIlroy, the 2016 FedExCup champion, sits solo second after consecutive sub-par rounds (69-71-65). Saturday’s 65, the tournament low (matched by Rickie Fowler and Jon Rahm), was bogey-free with five birdies and an eagle at No. 8 when he chipped in from the right-hand side of the green. The winner of the 2011 U.S. Open, 2012 and 2014 PGA Championship and 2014 Open Championship, McIlroy looks to complete the career grand slam. With a victory at the Masters, McIlroy would join five players who have won all four majors in a career (Gene Sarazen, Ben Hogan, Gary Player, Jack Nicklaus, Tiger Woods). In his 10th consecutive start in the Masters, McIlroy seeks his fifth consecutive top-10 at the Masters: 2014 (T8), 2015 (4th), 2016 (T10) and 2017 (T7). McIlroy is making his 37th start in a major (16 top-10 finishes). A 14-time PGA TOUR winner, McIlroy claimed his most recent victory at the 2018 Arnold Palmer Invitational presented by Mastercard. For the first time in eight starts at Augusta National, Rickie Fowler (70-72-65/3rd) recorded three par-or-better rounds to begin the Masters. In the 2017 Masters, Fowler sat T3 at 5-under through 54 holes, one back of Sergio Garcia and Justin Rose. A final-round 76 dropped Fowler to a T11 finish. In seven previous appearances (six rounds), Fowler’s final-round scoring average at Augusta National is 73.00. In eight starts on TOUR this season, Fowler’s final-round scoring average is 72.00. Jon Rahm moved into contention with a bogey-free, 7-under 65. His round included five birdies and an eagle at the par-5 8th hole. Rahm hit 15 of 18 greens in regulation, 9 of 14 fairways and required 26 putts. He has avoided three-putting any green in the first 54 holes. Rahm sat T55 after a first-round 3-over 75. The highest start by a Masters winner is 75 by Craig Stadler in 1982. Rahm seeks to become the fourth Spanish player to win the Masters, following Seve Ballesteros (1980, 1983), Jose Maria Olazabal (1994, 1999) and Sergio Garcia (2017). With rounds of 73-70-73-75, Rahm finished T27 in his only previous appearance at the Masters. In seven major championship starts (including this week), Rahm has advanced to the weekend six times. His best showing is T23 at the 2016 U.S. Open. Since his first PGA TOUR start as a professional at The National in June, 2016 (T3), Rahm has recorded 15 top-five results in 43 starts worldwide, including four victories (2018 CareerBuilder Challenge, 2017 DP World Tour Championship, 2017 Dubai Duty Free Irish Open, 2017 Farmers Insurance Open). Sweden’s Henrik Stenson sits fifth with rounds of 69-70-70. Stenson is making his 13th consecutive start in the Masters, where he has yet to record a top-10 finish. A T14 in 2014 is his best showing. Stenson has three top-10 finishes in four starts on the PGA TOUR this season; WGC-HSBC Champions (T2), Valspar Championship (MC), Arnold Palmer Invitational presented by Mastercard (4th) and Houston Open (T6). With six wins, Stenson owns the most victories on the PGA TOUR by a player from Sweden. No player from Sweden has ever won the Masters. Stenson claimed his first major championship title (and the first by a Swedish male) at the 2016 Open Championship. His four-round total at Troon (20-under 264) is the low 72-hole total in a major championship. This marks Stenson’s 47th major championship appearance. In 46 previous appearances, he’s collected 11 top-10 finishes (five of those have come at the PGA Championship). Despite a final-hole bogey, England’s Tommy Fleetwood (T6) tied his career low round in a major championship (66/R3/2017 The Open) with a 6-under 66 that included a five-birdie stretch on holes 12-16. Fleetwood has birdied the par-5 15th hole each round this week. Fleetwood’s T4 at the 2017 U.S. Open, his best showing in a major championship, earned a spot in the field at the 2018 Masters. It’s his second appearance at Augusta National after missing the cut in 2017 with rounds of 78-74. Fleetwood is seeking his first PGA TOUR victory in his 29th career start on TOUR. Fleetwood’s best showing in 28 previous starts on the PGA TOUR was runner-up at the 2017 World Golf Championships-Mexico Championship. This is the 11th appearance in a major championship for Fleetwood. Before playing in all four major championships in 2017 and making the cut in three (MC/Masters, T4/U.S. Open, T27/The Open, T61/PGA Championship), his T27 finish in the 2015 U.S. Open was the only time he had advanced to the weekend at any major championship. The four-time European Tour winner claimed his most recent title at the 2018 Abu Dhabi HSBC Championship. His best result in six PGA TOUR starts this season is T4 at The Honda Classic. Bubba Watson (T6), the 2012 and 2014 Masters champion, is making his 10th start at the Masters Tournament. His two wins mark his only top-10s in nine starts. Watson is one of three players with multiple PGA TOUR victories this season (Patton Kizzire, Justin Thomas) with wins at the Genesis Open and WGC-Dell Technologies Match Play. Marc Leishman (T6) sits eight off the lead after a third-round 73. Leishman is the only player in the top 14 on the leaderboard to shoot an over-par round on Saturday. Following a 6-under 66, Leishman shared the first-round lead at the 2013 Masters before going on to finish T4, his best showing in five previous starts at Augusta National. The only other time Leishman advanced to the weekend was in 2017 when he finished T43. In 25 major championship appearances before this week, Leishman has notched four top-10 finishes (T2/2015 The Open, T4/2013 Masters, T5/2014 The Open, T6/2017 The Open). Currently No. 24 in the FedExCup standings, Leishman finished No. 6 in last season’s FedExCup, advancing to the season-finale TOUR Championship for the first time since his rookie season in 2009. Now in his 10th season on TOUR, Leishman has advanced to the FedExCup Playoffs each season and finished no worse than No. 72 in the FedExCup. Leishman required 27 putts in each of the first two rounds, but 33 putts in round three. He has yet to record a 3-putt green in 54 holes. FedExCup champions Justin Thomas (2017) and Jordan Spieth (2015) sit T9 at 5-under, nine strokes off the lead. World No. 1 Dustin Johnson sits alone in 11th position at 4-under. Johnson’s 1-under 71 marked his first sub-par third-round at Augusta National in the seven times he’s advanced to the weekend. Tiger Woods posted an even-par 72 in his 81st round at the Masters to avoid a third-consecutive over-par round in a single Masters, something he has never done in 21 appearances at Augusta National. Doug Ghim, the only one of six amateurs to advance to the weekend, sits T47 with rounds of 72-76-74. After making two eagles in the opening round (Nos. 15 and 18), Ghim added a third for the week with an eagle at No. 15 in the third round. Ghim leads the field with the most eagles. Patrick Reed and Jon Rahm each have two eagles. Of the eight PGA TOUR Champions professionals who teed it up, three advanced to the weekend – Vijay Singh (79/53rd), Fred Couples (73/T36), Bernhard Langer (71/T36). This year, 23 countries are represented, one shy of the record 24 represented in 2015. There are 40 players from the United States, nine from England and five from South Africa. Spain, Australia and Japan each have four players in the field, while Germany, China, Canada and Sweden each have two representatives. Countries with one player in the field include Thailand, Argentina, Korea, Scotland, Northern Ireland, Italy, Chile, Belgium, India, Fiji, Venezuela, Austria and Wales. First timers at the Masters (16): Tony Finau (T15), Satoshi Kodaira (T21), Haotong Li (29th), Xander Schauffele (T43), Doug Ghim (T47), Wesley Bryan (MC), Austin Cook (MC), Harry Ellis (MC), Dylan Frittelli (MC), Patton Kizzire (MC), Yuxin Lin (MC), Yusaku Miyazato (MC), Joaquin Niemann (MC), Matt Parziale (MC), Doc Redman (MC), Shubhankar Sharma (MC). After no bogey-free rounds were recorded the first two days, four players went bogey-free in round three; Rory McIlroy (65), Rickie Fowler (65), Jon Rahm (65), Si Woo Kim (68).